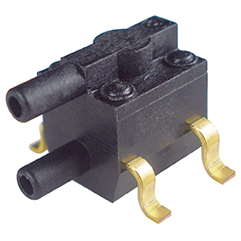 26PC Series, compensated/unamplified, wet/wet differential, ±1 psi, SMT, straight port. The 26PC SMT (Surface Mount Technology) pressure sensor, the first offering in the 20PC SMT family of pressure sensors, is a small, low cost, high value, pressure sensing solution for use with printed circuit boards (PCBs). Based on the long established reliability and accuracy of the 26PC pressure sensor, the 26PC SMT offers reduced size with true SMT capability. The smaller size reduces the sensor's footprint on the PCB, thereby reducing the size of the PCB. The 26PC SMT is the first pressure sensor capable of being used with other SMT components on the PCB, helping to lower installation costs and eliminate secondary operations. The sensor features Wheatstone bridge construction, silicon piezoresistive technology, and ratiometric output for proven application flexibility, design simplicity and ease of manufacture. Although designed for the medical industry, the 26PC SMT pressure sensor may be applied in any industry that requires a surface mount pressure sensor.